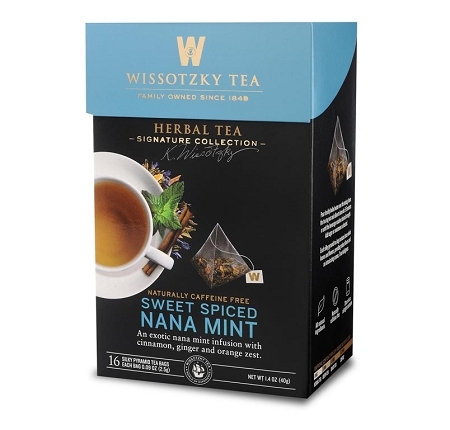 An exotic nana mint infusion with cinnamon, ginger and orange zest. A perfect treasure brimming with joy. Revive your spirit with fresh nana mint and Peppermint superbly blended with sweet Cinnamon bark, zesty Orange peel, spicy Ginger root, Clove, Stevia leaves, Pepper fruits, and Cornflowers. Lose yourself in this truly unique tea. Each silk pyramid tea bag contains loose whole leaves and flowers, providing robust flavors and an intoxicating aroma. True Indulgence. Pour freshly boiled water over the teabag, leave the tea tag out and allow to brew for 3-5 minutes or until the beverage reaches desired strength.